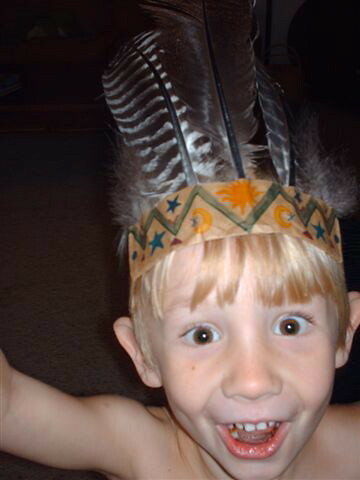 wild indian jake, originally uploaded by Temeculamom. Okay, I’m his auntie, so I am undoubtedly biased. This is my 4 year old nephew, Jacob. He recently made up a poem about pickles and recited it to my sister, who wrote it down and emailed it to me. Like pickles on a Christmas tree. Like pickle kites that fly high in the sky. Like pickle pie and pickle cake. Oh, a few days later, my sister sent me this crazy photo of Jake dressed up in a feathered head dress-looking slightly less sophisticated than the poet of earlier in the week. ~ by bekaboo on September 24, 2007. I think you’ll be surprised if you buy that book (Pickle Things), that your nephew has somehow managed to write the very same poem, word for word. That’s hilarious! I bet he heard it at preschool and just memorized it! I will have to let my sister know. Thanks for the information.